The current winning run the Texans are on is their biggest streak since 2012, with the longest taking place in 2011. This feels different because it’s following an 0-3 start that produced a lot of columns and tweets that @freezingcoldtakes is going to have a lot of fun with if the season keeps going as it has the past five weeks. The Texans players never bought into panic mode when they hit 0-3. Yes, it was a terrible start but they were hardly getting dominated. They just failed to make clutch plays in the second half of games. A play here or there would have made a huge difference in the Giants and Titans games. And the Patriots tilt, which feels like six months ago, began with a fumble on the very first Houston offensive snap. Even the first three wins were close games that could have turned on a dime. But the Texans executed and prevailed. Those who critique the victories with a glass-half-empty view, pointing out that the opponents made mistakes, should remind themselves what sport we’re following. This is the NFL, where avoiding mistakes is one of the huge keys to victory every week. The last two games have seen the re-emergence of the running game. Lamar Miller has back to back 100+ yard contests and is the first Texan to do that since Arian Foster back in 2014, Bill O’Brien’s first season. DeAndre Hopkins is making out-of-this-world catches and, having had a gigantic game on national television, is firing up more debates on who is the best wide receiver in the NFL. I’ll always point out how this franchise has been blessed by number one receivers for every year of its history but the first. Andre Johnson arrived in ’03 and passed the baton, over a two year period, to Hopkins. Supplying Hopkins with enough pass catching co-workers is a bit of a challenge with Keke Coutee in and out of the line up with hamstring issues and now Will Fuller V out of the line up for the rest of the season. But, O’Brien believes they have options in the building that can help the cause. The defense continues its tear as well, taking the ball away and playing big on third down. It’s notable that Houston more than held things together with Johnathan Joseph leaving the Miami game, depleting an already personnel-strapped cornerback crew. And Zach Cunningham’s injury didn’t make things any easier on a linebacker group already living without Dylan Cole. It’ll be up to O’Brien and Brian Gaine to figure out a way to restock the talent as the injury bug does its damage. But the most important player on the team is upright and tormenting defenses with his elite playmaking skills. Deshaun Watson is a unique player who is fiercely competitive and you get the feeling watching him that the Texans are never out of a game, that no play or situation is impossible. And he’s just getting started. We’re at the halfway point. The 0-3 start has been wiped away by a 5-game winning streak. The second half is on the way and it starts in Denver. The fact that the Texans have the weekend off, play the Broncos then get a bye means they have one game in a 24-day span. Then it’s time for the last seven outings. Three of them are against division opponents, all at home. This is as exciting an opportunity as this team has ever had. They just have to find a way to stay healthy, heal the players that can possibly come back and keep improving on the field. The second act begins next week. 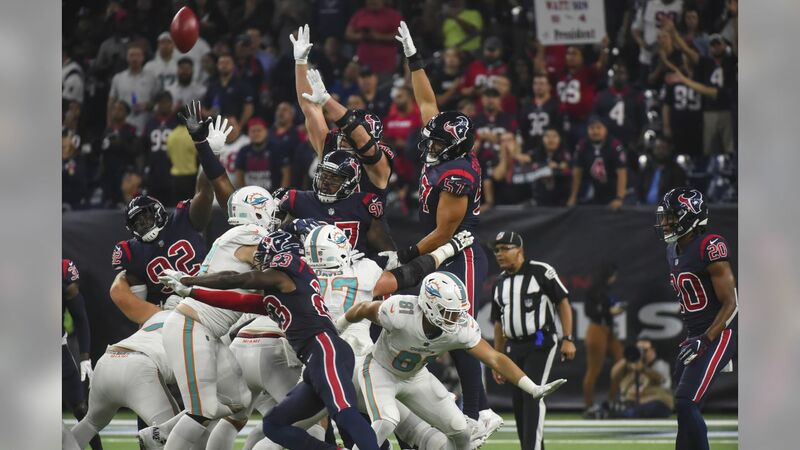 The Houston Texans defeated the Miami Dolphins at NRG Stadium for Week 8 of the 2018 NFL season.